Virgin Galactic says its spacecraft designed to launch tourists into space completed an important test flight on Thursday. The rocket ship, called SpaceShipTwo VSS Unity, climbed more than 82 kilometers during the flight above California's Mojave Desert. Virgin Galactic said by reaching this height, the spacecraft had reached the boundary of space for the first time. The 80-kilometer space boundary is used by the U.S. Air Force and other U.S. agencies. That differs from a long-held view that the boundary is reached at 100 kilometers. 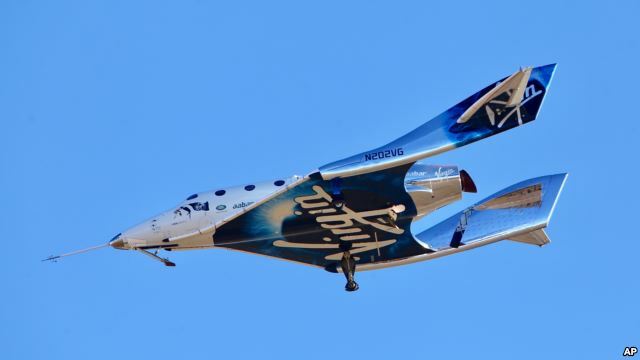 Virgin Galactic officials say recent research favors the lower number. At the start of the flight, a special plane carrying the VSS Unity climbed to nearly 13,700 meters before releasing the spaceship. The VSS Unity then fired up its rocket engine and quickly traveled up and out of sight from a group of watchers on the ground. Virgin Galactic's carrier airplane WhiteKnightTwo carrying a space tourism rocket plane SpaceShipTwo takes off from Mojave Air and Space Port in Mojave, California, U.S. in a still image from video December 13, 2018. The spacecraft was piloted by Mark Stucky and former NASA astronaut Frederick "CJ" Sturckow. During the flight, the two men were able to experience weightlessness and see the curvature of the planet, the company said. The spaceship reentered the atmosphere at 2.5 times the speed of sound and landed safely a few minutes later. In addition to the pilots, the spaceship carried four NASA research payloads and a mannequin named Annie. Virgin Galactic's chief, British billionaire Richard Branson, watched the flight from the ground. "Today we have shown Virgin Galactic can open space to the world," he said. Branson met the pilots after the flight and declared "Space is Virgin territory!" Virgin Galactic's latest success comes four years after another spacecraft crashed during a test flight that killed the co-pilot and seriously injured the pilot. The crash led to major delays in the company's progress in taking tourists to space. Branson said after Thursday's test he aims to launch the company's first space flight with passengers - including himself - by March 2019. More than 600 people have paid for or put down deposits to fly aboard Virgin's suborbital flight. Famous people including actor Leonardo DiCaprio and music star Justin Bieber are among them. A 90-minute flight costs $250,000. Richard Branson is not alone in the space tourism business. Amazon founder Jeff Bezos launched Blue Origin, which also plans to take space tourists on suborbital trips. Blue Origin will use the more traditional method of spacecraft attached to a rocket launched from the ground. Also, SpaceX founder Elon Musk recently announced plans to take a wealthy Japanese businessman and his friends on a trip around the moon. Bryan Lynn wrote this story for VOA Learning English, based on reports from the Associated Press, Reuters and Virgin Galactic. Hai Do was the editor.